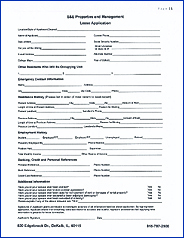 To submit an application for an apartment, please download the lease application and fill out all applicable information. There is a $20 application that is due at the time you return your application because we do a basic credit and background check. If you choose to email your application to us, please be aware that until we receive the $20 application fee we cannot process your application. Adobe Reader is required to view the application. To discuss these apartments or if you have questions please call our office at (815)787-2500 or send us an email at: Nicolette@ApartmentsInDekalb.com.